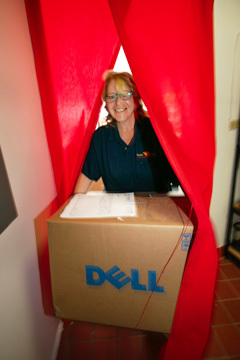 Debi Ross is both manager and computer tech at the Kapolei outlet of SuperGeeks. 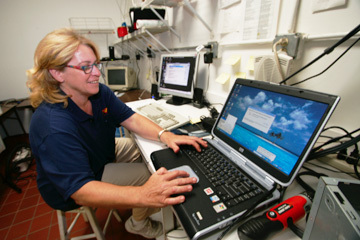 On Thursday, she carried a computer into the store's back room where she intended to work on it. Debi Ross has an inquiring mind, which is one reason she was hired in 2003 to work for SuperGeeks Corp., the Honolulu-based company well known for repairing malfunctioning computers. In January, she was named manager of the firm's outlet in Kapolei, where she oversees one other employee and relishes the challenge of figuring out how to repair the many malfunctioning computers that customers bring in. Ross, 46, is a graduate of Lackey High School in Indian Head, Md., has an A.S. degree in psychology from Napa Valley College in California, worked as a "psych nurse" in California for awhile, then started in the computer field after moving to Hawaii in 1991 with her husband, Woody, who was in the Navy at the time. The mother of an adult son, Ross and her husband live in Makakilo, along with about 40 parrots, four dogs and two cats. Question: Are you a geek? Answer: I am definitely that. Through and through. Q: Are you a super geek? A: Absolutely, yep. One of my most favorite things is to sit back here and work on these computers. Q: What computers are those? A: The customer computers that are not working -- and the worse off they are, the better. Q: What's the most typical repair that you guys work on? A: The most frequent and common problem is spyware and viruses. Q: How do people know that they have those things? A: Well, a lot of times it will disable the computer or slow it down to the point that it can't do anything. But the main thing for the spyware is they'll start getting multiple pop-up ads. Q: You mean even when you don't go to a particular Web site? A: Right, because what they've done already is download a program that has spyware built into it. Q: So would you have to have your browser on? A: Not necessarily. Once the spyware is in there, you don't have to have your browser on. Because a lot of people have broadband, they're always connected to the Internet, so you don't have to have the browser open and you can have pop-ups anyway. And it slows the computer down unmercifully. For example, if you wanted to open Word, it could take a couple of minutes to open up, if it opens at all. Q: So it would seem we're talking mostly about PCs. A: Oh, right. It doesn't affect Mac -- yet. (Laughter) And you know, one of the common reasons for that is the world is mostly all PCs, so the people that write the spyware programs concentrate on where they're going to get the most action. Q: Do you get many Mac customers? A: We don't get any over here (in Kapolei), because we always refer to our headquarters office, because we have a Mac specialist over there. Debi Ross repairs computers for SuperGeeks in Kapolei. On Thursday, she ran a virus-protection program. Q: What do you do at the Kapolei store? A: I fix all the computers. I'm the manager of the store, so I put out fires from time to time -- the usual management duties of the store. But mostly what I do is fix the computers. Q: When you're doing the repair work, what kind of work environment is that? A: I have a lot of diagnostic tools and software that I use, as well as your typical screwdrivers and such, and a hammer when things really get out of line. Nah, I'm just kidding. Q: How many people work for you, and in what capacities? A: I just have one (Ron Arreola). He's the check-in clerk, and he takes care of all the customers when they come in and when they go back out. When they pick their computers up, he shows them the programs we put on to control those viruses and spyware. A: Um, I think I had my resume on one of those careerbuilder, Monster.com-type Web sites, and Rena (Kelley, vice president of SuperGeeks) called me up one time and wanted to know if I would come for an interview and I did. Q: What were you doing before you joined SuperGeeks? A: Before that, I was doing RoadRunner installations as a private contractor, and before that I was working as a computer instructor at a computer training school here on the island. And before that I was working at Halawa teaching the inmates how to build and repair computers. Q: Do you guys ever make house calls? A: I used to when I first started working for the company. I was an outside technician, but the traffic is unbearable, so now people have to bring their computers in. Q: What about business customers? A: We have several that are here locally in Kapolei that bring their computers in, but mostly business customers want on-site service. Q: And you don't do that? A: No, not out of this store. They make all of the on-site calls out of the main office (on King Street), because it's just me here as a tech. Q: What kind of computer do you own personally? A: I have a Dell laptop. I wouldn't have anything else. I'm serious. I love Dells. Q: How do you keep up with the latest developments in the computer world? A: I tell you, I spend hours and hours and hours outside of work staying on top of this stuff, because it's changing every day, and if you don't stay on top of this stuff, it will get away from you -- within a week or two. But I'm so interested, it doesn't feel like work at all. Like right now I'm working on probably the most infected computer I've ever worked on, but I'm loving it. It's irritating but it keeps your mind rolling. A: In fact, it's not even irritating. It's fun. I really, really enjoy doing it.